These instructions are assuming you know a little about crochet. I'm using UK terms with American terms in brackets. This took approximately 4 hours to make for my daughter but may take longer for a bigger hat. thick yarn in black (double knit was used in this hat) approx 25g. Pair of scissors and a needle to stitch on the eyes, mouth and to stitch in the ends. Skills Needed: I think I've included all that's needed in the instructions - if you're not sure then just wing it (that's half of the fun and creativity) or have a good look at some of the skills on youtube as there are plenty of useful demonstrations to be found on there. Using a 5mm crochet hook and with a white aran weight yarn (or as thick as you want it) make a slip knot and create 5 chains, slip stitch through first chain. Chain 3. Half Triple Crochet (Half Double Crochet) i.e yarn over, insert through first chain made, yarn over and pull through chain, yarn over pull through all loops on hook. Do this twice into the next chain and for all chains made (8 crochet stitches made). Slip stitch into first HTC (HDC). Takes a bit of practice but don't worry if it's not perfect. 2nd row - Chain 3, HTC (HDC) into each stitch twice, slip stitch into 1st chain of the row. 3rd row - as with 2nd row (approx 32 chains made). 4th row - HTC (HDC) once in every stitch and twice in every 4th stitch. If you need the hat to be bigger, then make a 5th/6th/7th row with HTC (HDC) once in every stitch and then twice in every 5th on the 5th row, 6th on the 6th row etc this is only a guide and your own judgement on this is advised. Once you have the hat wide enough, simply chain 3 at every new row to give it height and make 1 HTC (HDC) in every stitch which will not increase the hat any more but will create the side of the hat. Continue with as many rows as needed then slip stitch through last stitch, cut yarn and slip knot through last stitch. Measure approximately 10/11 stitches from back of hat, attach white yarn and HTC (HDC) 12 across, turn, chain 2, skip a stitch then HTC (HDC) across until 9 stitches made, turn, chain 2. Continue until 7 stitches are made on 3rd row, 5 on 4th row, 3 stitches on 5th row and 2 on last row. Cut thread and slip knot. Repeat for other side to make ear covers. Using black thread DC (SC) i.e insert hook, yarn over, pull through stitch, yarn over and pull through all hoops on hook - all the way around the hat. 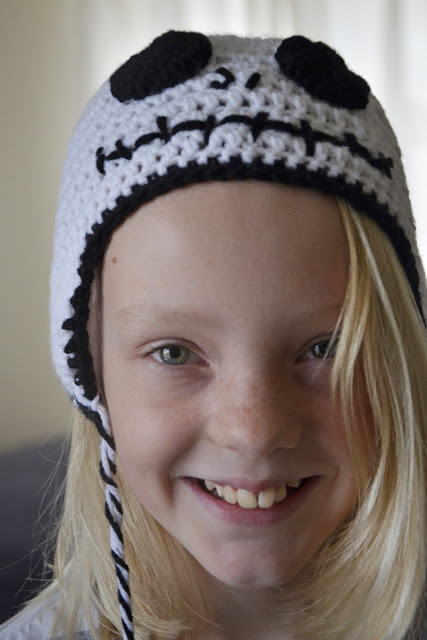 Use a long length of black and white yarn and with each yarn, fold in half and thread through ear flaps and tie. Pick up a black and white thread and twist until you are happy with the effect and tie a knot at the end. Repeat with the other black and white thread. Join the two twisted yarns and twist them together, knot them at the end. Do the same with the other ear flap. Using black yarn and a 3mm hook, chain 5 and do as you did to make the hat but instead of HTC (HDC) use DC (SC) stitch. Make about 5 rows. 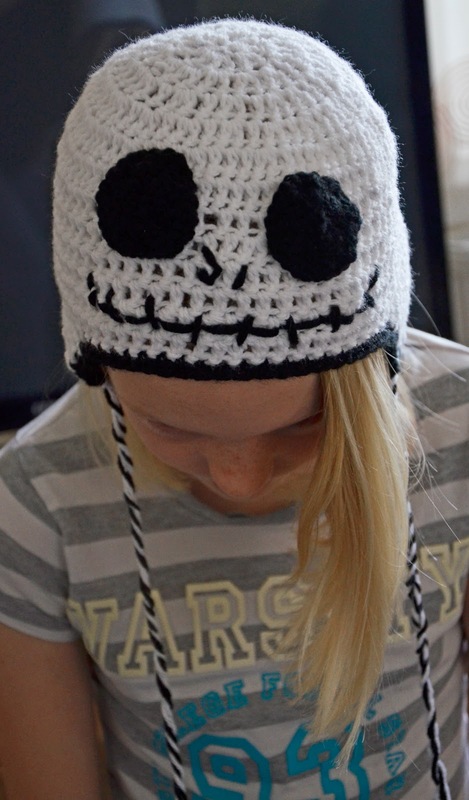 Make another eye and stitch them using your large eyed needle (a yarn needle is ideal) to the hat. Using black yarn, create two diagonal stitches to make the nose. Make a grim grin as shown by back stitching horizontal and vertical stitches. Stitch all loose ends to make the hat neat. Voila!